A significant superyacht comes on the market as Luc Khaldoun at Edmiston & Company tells me he's listed the mighty 85m Delma for sale. Built by Greece's Neorion yard in 2004 to DNV class, she was formerly known as Annaliesse. A highly successful charter yacht, Delma can accommodate up to 36 guests in 18 well-equipped and large staterooms. With huge interior volume, she has a 200sqm spa and gym complex as well as a conference room, cinema and multiple lounge and dining areas. With a fully certified helicopter pad, which can be transformed into a sunbathing area or party deck, Delma has extensive exterior entertaining areas including alfresco dining for all guests aft on the bridge deck. Twin 2,760hp Caterpillar engines give her a cruising speed of 14 knots. 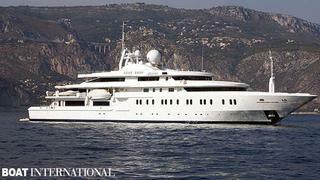 Delma is currently cruising the Eastern Mediterranean and is asking €53 million.